Win a case of Scotties to take care of cold and flu season during the Scotties Sweepstakes. For your chance to win, visit scottiesfacial.com/win and register. Increase your chances of winning by entering daily through February 7, 2019. The Win a Case of Scotties Sweepstakes is open to legal residents of and currently residing within the 50 United States and the District of Columbia, who are 18 years of age or older at time of entry. The Sweepstakes begins on January 10, 2019 at 9:00:00 a.m. ET and ends on February 7, 2019 at 11:59:59 p.m. ET. Limit one (1) entry per person/household per day. 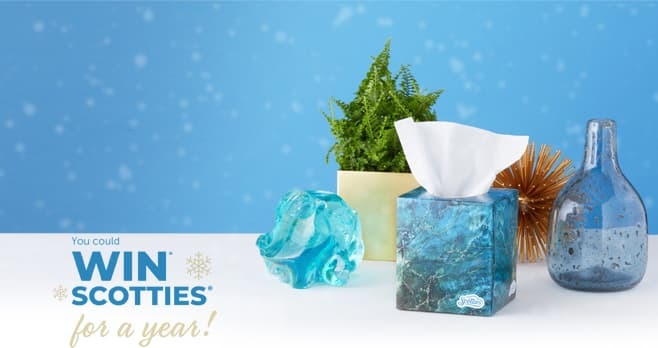 The grand prize consists of a year’s supply of Scotties facial tissue consisting of thirty-six (36) boxes of Scotties 64-count 2-ply Facial Tissues. Visit www.scottiesfacial.com/win to enter and see Official Rules for details.